Are you sending out Holiday cards this year? I don’t usually, but these fabulous cards (and gift wrap) from Green Field Paper are causing me to reconsider. 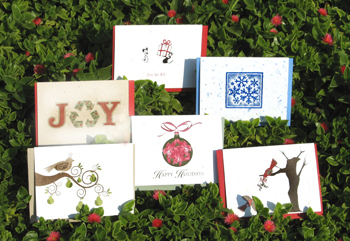 The company offers three options in earth friendly card giving. First is the traditional Grow A Note cards, which are made from 100% recycled paper infused with wildflower seeds. Another fun option is the Junk Mail Joy cards, “We take our junk mail and add it to post consumer pulp to make this truly unique paper, We have now used our recycled joy design to create this truly unique 110% recycled card.” (From the website). A third option in cards is the hemp for Joy of Recycling (a blend of 25% hemp and 75% post consumer waste) or the Hemp Heritage (made entirely from hemp plant). In addition to the cards, Green Field Paper company also carries recycled gift wrap. The gift wrap is printed with soy based inks on 100% post consumer recycled material. The colors are vibrant, the designs are fun and its paper you can feel good about using. The cost may be a bit prohibitive and is making me ponder if I can make my own. I have no doubt I could manage to make paper embedded with wildflower seeds, but I definitely can’t use soy based inks or come up with such pretty designs. If you are looking for a delightful card option with a message that’s not just greenwashing, check out Green Field Papers cards. “The finest in Tree-Free paper, stationary, custom invitations & promotional products.” There are several options on the website that would make wonderful Holiday gifts, such as a Garlic Note Set or a Cafe Journal.